As the seasons change from summer to fall, we reflect back on the summer accomplishments of NOAA’s network of Habitat Focus Areas (HFAs). HFAs tackle a wide range of habitat issues including reducing sediment runoff, improving coral health, restoring salmon habitat, preventing the spread of invasive species, reducing nutrient inputs, and many more. Here is a look back at several completed or ongoing keystone projects in HFAs from summer 2017. The Manell-Geus HFA team is working with many partners including University of Guam, Underwater World Guam, and SECORE International to improve coral propagation methods to support reef restoration efforts. Managers hope that watershed and reef restoration efforts in the HFA will boost the recovery of these important habitats which are threatened by erosion, warming water temperatures, and coral bleaching. When coral bleaching occurs symbiotic algae within the coral become stressed and leave, which causes the coral to lose its major food source and make it more vulnerable to disease. In July, the team successfully tested new methods to settle coral larvae on tiles that will be grown and used to restore impacted reefs. They hope to use these methods to scale up coral propagation efforts for other species, such as staghorn coral. These corals create important habitat for juvenile reef fish, but the staghorn thickets in Cocos Lagoon experienced severe die-offs (80-90%) during coral bleaching events in 2013, 2014, and 2016 and are currently bleaching again. During the summer, the team was also able to showcase HFA efforts on a ridge to reef tour during a recent visit with staff from Congresswoman Madeleine Z. Bordallo’s office. 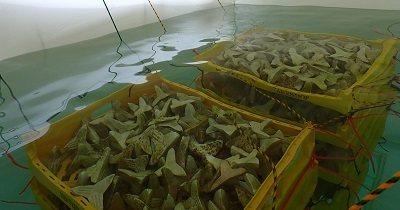 Photo: Tiles pictured here were successfully used as a place for young coral to settle, grow, and eventually be used in reef restoration efforts. The West Hawai’i HFA continues to complete activities in Pelekane Bay to reduce sediment runoff from land that can smother and kill corals. 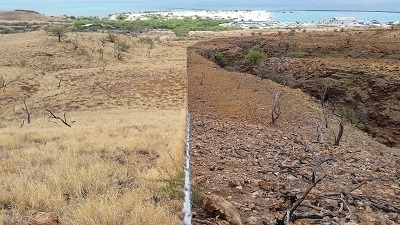 The Kohala Center and the Kohala Watershed Partnership, a voluntary coalition of private landowners and public land managers partnering with NOAA on some HFA activities in Pelekane Bay Watershed, installed fencing to contain feral goats which denude the slopes and contribute to increased sediment runoff across the landscape. The goal of the fencing is to keep goats in one area and minimize their impact on land erosion before they are relocated. NOAA, U.S. Geological Survey, The Nature Conservancy, Kohala Center, and the National Park Service have partnered to map areas that are most susceptible to erosion (i.e. erosion “hot-spots”) by collecting and testing soil samples to better understand the characteristics and flux of sediments during rain events. Mapping these areas which are highly susceptible to erosion informs resource managers of where additional fencing projects that could be installed for the highest impact. In addition to these recent activities, the office of Senator Mazie Hirono announced in August 2017 NOAA’s award of nearly $650,000 in grant funding to the Kohala Watershed Partnership to fence off approximately 8,500 acres of watershed and remove up to 1,000 feral goats from the landscape. Photo: Coastal slope in Hawaii shows the difference between area without (left) and with (right) goats. In collaboration with sawfish researchers at the National Marine Fisheries Service Miami Laboratory and the University of Miami, the Biscayne Bay HFA is working to better understand endangered smalltooth sawfish activity and habitat use in Biscayne Bay. It is not currently well understood if smalltooth sawfish utilize habitats within Biscayne Bay and scientists are gathering this information from individual sawfish with acoustic tags. These tags ping to stationary receivers that “listen” for sawfish underwater. This summer, the network of acoustic receivers in the HFA successfully detected two tagged sawfish in Biscayne Bay – the first records of sawfish detected in Biscayne Bay! This was exciting news since researchers had been “listening” for sawfish for a whole year in this area without any other detections. This fall and winter acoustic receivers will continue to detect any tagged sawfish in Biscayne Bay. Scientists are excited to obtain more data on sawfish habitat use in the HFA to better inform management and protection of this endangered species. This summer, the Muskegon Lake HFA achieved their target of reduced phosphorus levels on a project in Bear Creek. Phosphorus is a naturally occurring nutrient within water and sediments, however, too much phosphorus can be harmful. These high levels of phosphorus were caused by previous celery farming in the area. The NOAA Restoration Center worked with partners including the Great Lakes Commission, West Michigan Shoreline Regional Development Commission and the Annis Water Resources Institute on the Bear Creek Hydrologic Reconnection and Restoration project in Muskegon, MI. The project restored and connected two ponds, previously farmed for celery, adjacent to Bear Creek which eventually flows into Bear Lake then Muskegon Lake. The celery ponds were previously wetlands separated from Bear Creek by a system of berms and pumped dry in order to farm the organic wetland soils. Pre-construction monitoring determined that excessive amounts of phosphorus were present in both the water column and the sediments of the ponds. The habitat restoration removed 182,735 tons of phosphorus-laden sediments, restored 36 acres of wetlands and 2,015 feet of stream bank. As a result of the work, total phosphorus in the water column within the restored wetlands was reduced from the maximum levels of 850 micrograms per liter observed prior to construction to below the target of 30 micrograms per liter of total phosphorus. Photo: Construction in-progress during the, now complete, Bear Creek project in which tons of harmful, phosphorus-laden sediments were removed to improve the habitat. 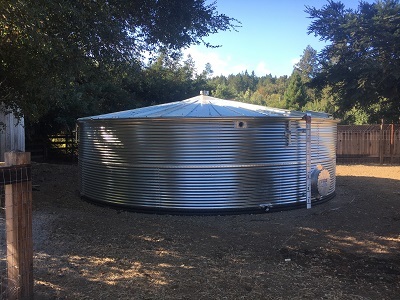 In collaboration with Gold Ridge Resource Conservation District and the Sonoma County Water Agency, the Russian River HFA installed one 15,000 gallon tank system and one 30,000 gallon tank system for private landowners on Mill Creek (Dry Creek watershed) this past spring/summer. This creek serves as important freshwater habitat for endangered Central California Coast coho salmon and other fish. These tank systems support salmon habitat restoration efforts focused on maintaining sufficient water flows in California creeks during the dry summer in the Russian River watershed. The tanks also help provide water to local residents during times of drought and low streamflow. This project, along with the Westminster Woods project, are just two of the many projects ongoing in this HFA to help support the recovery of endangered salmon in the Russian River watershed. Photo: A 33,932 gallon galvanized steel water tank was installed to store rainwater captured from the barn roof and the roof of the tank. The stored water will be used in the summer for outdoor irrigation to reduce the amount of water pumped from a near-stream well. In the Penobscot River HFA, nature-like fishways are under construction in the Bagaduce River watershed. These engineered, yet natural-looking structures allow fish migration upstream into freshwater habitats. 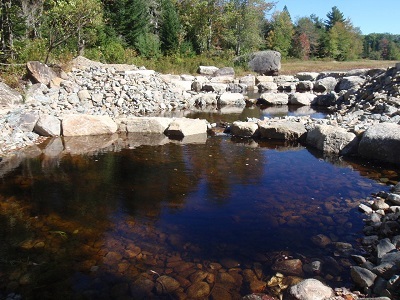 Located in the town of Penobscot, Maine at Wight and Pierce Ponds, the projects will primarily benefit alewives which were previously unable to utilize these habitats due to barriers. Also in the Penobscot HFA this summer, NOAA leadership visited several of the completed and ongoing projects contributing to Atlantic salmon recovery in this region. The HFA is collaborating with local groups and communities to improve the passage for Atlantic salmon and better understand fluctuations in their population. Photo: The newly constructed nature-like fishway allows alewives and other fish to pass upstream to access important freshwater habitat. 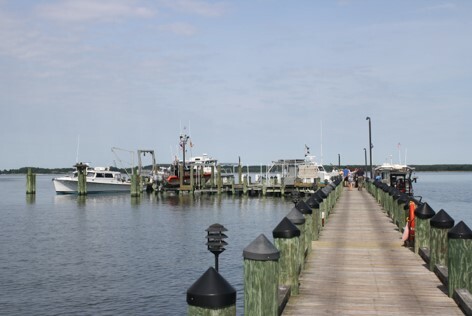 Projects in the Choptank River HFA are focused primarily on improving water quality, restoring oyster reefs, and creating resilient coastal communities. The HFA also supports Envision the Choptank, a collaborative organization that pairs local knowledge and values with science and technology to implement targeted and effective restoration work. In order to engage local communities in restoration efforts, HFA partners surveyed Choptank watershed residents over the summer to learn more about what they treasure most about the watershed and their hopes for the future of their communities. Final survey results are anticipated this fall. 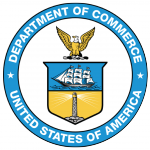 The partners will use this information to build on existing restoration projects in the HFA that support clean Choptank waters, productive oyster reefs, and thriving coastal communities. Photo: Dock in the Choptank River watershed utilized by commercial and recreational fishers.